The simpler things are, the harder they are to get right. The cappuccino is one of those things. One part espresso, two parts milk… sounds easy enough. But for the same reason that it consists of only two ingredients, if either one of them is the least bit off, what otherwise would be a symphony of flavors and textures ends up being crap. The coffee needs to have been grown, harvested, processed, transported, roasted, blended, ground, and brewed properly for it to realize its full potential. Because espresso has such a concentrated flavor, any flaws are greatly magnified. The other side of the coin is that when things come together in the right way, it can be transcendental. Properly prepared espresso should exit the portafilter looking like warm honey and be topped with a brown-flecked layer of crema the color of mahogany. If you’ve been in very many coffee shops, I’m sure you’ve heard the high-pitched squeal of milk being steamed. That, my friends, is a sure sign that you should leave the shop. When you find a good shop, watch the attention that the baristas give when steaming milk. Notice that they don't shove the pitcher under the steam wand and walk away to perform other tasks. Properly steamed milk has a velvety texture and natural sweetness that is the perfect complement to espresso, not something to cover up the bitterness. A cappuccino should never have a layer of dry milk froth on top, but the milk should be fully integrated into the drink, giving it a rich creamy mouthfeel. 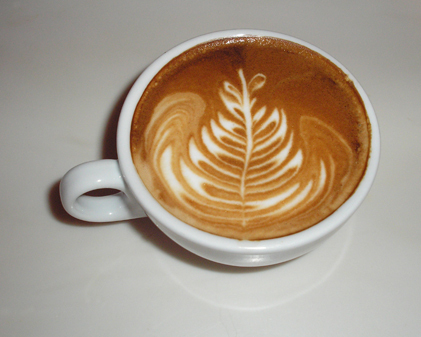 Just as food can be plated in a way to enhance its appearance, experienced baristas know how to manipulate the milk pitcher while pouring to create "latte art." Different shapes include, rosettas, hearts, apples, and more. Prepared properly, the cappuccino is a joy for the eyes and the palate.